The Indian smartphone market has just been blessed with one more unique handset in the form of Samsung Galaxy A9 (2018) (first impressions). This one prides itself on its quad-camera configuration on the back. Come to think of it, it was only a couple of months ago that Samsung had also given us the Galaxy A7 (2018) (review) which boasts three rear cameras. That’s quite fast a rate at which the South Korean giant is adding camera sensors to its handsets. Anyway, seeing that the Galaxy A9 starts at Rs 36,990, it’s directly challenging the reign of the OnePlus 6T (review), which may not have four cameras, but has its own set of unique capabilities. So if you’re torn between the two, then let us help you in making a buying decision between the A9 and 6T. Both the phones feature exquisite looks. While the Galaxy A9 manages to get your attention with the four-camera array on its back, the OnePlus 6T does that with the waterdrop notch on its front. The tiny cut-out is quite a welcome addition compared to the larger notch on the OnePlus 6 (review). In terms of the construction, both phones have gone for glass backs and metal frames. And while the Samsung device features a traditional fingerprint reader on its rear surface, the 6T has ditched it in favour of a futuristic in-display fingerprint scanner. Both the phones charge via Type-C ports, but only the Galaxy A9 retains the headphone socket which the OnePlus 6T has so famously rejected. Coming to their front, Samsung’s phone comes with the famed Infinity Display. With its curved corners and no-notch approach, it impresses a great deal. But the OnePlus 6T’s display is even more impressive owing to its full-screen approach that leaves very minimal bezels on all sides. The display on the Galaxy A9 measures 6.3-inch diagonally and the Super AMOLED panel bears a resolution of 1,080 x 2,220 pixels. The one on the 6T on the other hand, is a 6.4-inch AMOLED screen with a resolution of 1,080 x 2,340 pixels. There’s a massive difference in terms of the internals on both of these phones. The OnePlus 6T sports the top-of-the-line Snapdragon 845 chipset, which ships with a 2.8GHz octa-core processor and an Adreno 630 GPU. But at a similar price point, the Galaxy A9 delivers the mid-range Snapdragon 660 SoC, which comes with a 2.2GHz octa-core processor and an Adreno 512 GPU. The Samsung phone reserves 128GB of storage for both its 6GB and 8GB RAM variants. In contrast, the 6T’s 8GB RAM version can be purchased with 128GB or 256GB of storage, while its 6GB RAM model comes with 128GB of storage. As usual, the OnePlus’ offering misses out an expansion slot, while the A9 lets you expand the storage further by inserting a microSD card. The main reason for the Galaxy A9 adopting a four-camera module is to offer all the dual-camera implementations in a single package. Its 24MP main camera is meant for regular shots, while its 8MP camera provides ultra wide-angle photos. The 10MP tertiary camera delivers 2x optical zoom, while the last snapper is a 5MP unit aimed at providing Live Focus effects for portrait shots. The OnePlus 6T on the other hand, delivers the same camera setup as that of its predecessor. That means you get a 16MP main snapper that combines its prowess with a 20MP secondary snapper. With the combination, you get portrait and studio lighting effects. The front camera on the Galaxy A9 is a 24MP unit, while that on the 6T is a 16MP one. 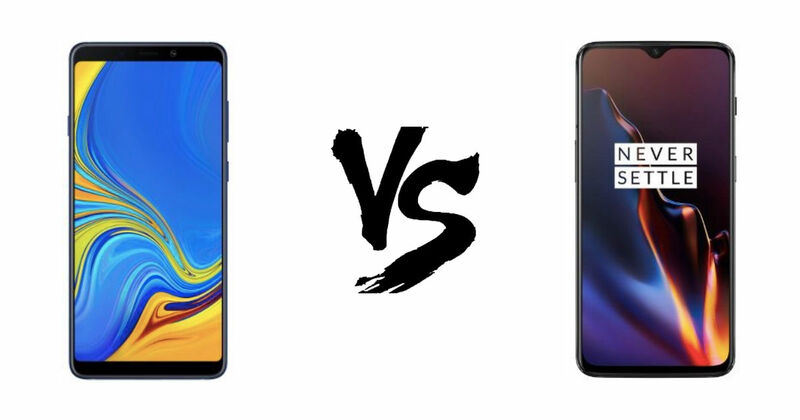 Samsung has packed a 3800mAh cell on its latest smartphone, whereas the OnePlus 6T ships with a 3,700mAh battery. There isn’t much difference between the two, but OnePlus has implemented a few key features like Sleep Standby and more. Plus, thanks to its Dash Charge support, the 6T is one of the fastest charging phones around. None of the two handsets support wireless charging however. When compared to the OnePlus 6T, the Samsung Galaxy A9 falls short in the performance department. While its four-camera setup may seem very alluring on paper, the 6T might come across as a better all-rounder. So the Galaxy A9 is strictly for photography buffs, but for everyone else, the OnePlus handset is the one to go for.